"Amazingly flavorful taco 'meat' made with quinoa, smoky seasonings, and salsa, right in the Instant Pot®! Baked until hot and crispy. A great substitute for ground beef, with just 9 ingredients." Rinse quinoa thoroughly in a mesh strainer. Add quinoa and water to a multi-functional pressure cooker (such as Instant Pot(R)). Stir in vegetable bouillon. Close and lock the lid. Select high pressure according to manufacturer's instructions; set timer for 10 minutes. Allow 10 to 15 minutes for pressure to build. Transfer cooked quinoa to a large bowl. Add salsa, nutritional yeast, cumin, chili powder, garlic powder, salt, and pepper. Toss to combine. Spread mixture on the prepared baking sheet. Bake in the preheated oven for 15 minutes; stir. Continue baking until quinoa is dry and crisp, 5 to 15 minutes more. Use any variety of quinoa you like. 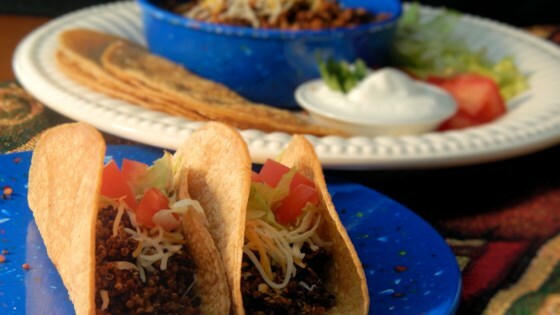 We thought this was a great recipe and a nice change of pace from tvp or lentil taco meat.